A reinstatement is a straightforward solution to avoid foreclosure. It is also the most difficult. A reinstatement is when a homeowner brings the mortgage current. To do this, a homeowner requests the total amount owed to the lender, as of the date of the reinstatement, including late charges and fees, and pays that amount in full. Advantage: A homeowner does not need the lenders approval to reinstate the loan. A loan can be reinstated up to the day before the final foreclosure sale. Disadvantage: All missed payments, plus late fees and fines must be paid. Unless a homeowners’ financial situation changes drastically, most homeowners are not able to reinstate their loan. Repayment plan or forbearance allows the homeowner pay missed payments over a period of time. The terms of repayment must be negotiated with the lender. Typically, a homeowner will pay a portion of the back payments owed together with their regular mortgage payment. Advantage: Missed payments can be paid over time. Disadvantage: Must have financial resources to pay current mortgage plus an additional negotiated amount. Some lenders have “qualifying” criteria for a forbearance or repayment plan. Modifying a mortgage involves reducing the interest rate on the loan, reducing the principal balance of the loan, changing the term of the loan, or any combination thereof. Mortgage modifications typically result in a lower, more affordable payment. Advantage: Creates an affordable monthly payment and/or principal balance reduction may allow a homeowner to keep their home. Disadvantage: A homeowner must “qualify” for a loan modification and provide documentation to support the ability to continue to make payments. If a homeowner can rent their home for more than the mortgage payment, then the property can be converted to a rental and use the rental income to pay the mortgage. Advantage: Homeowner can keep the property for an indefinite period of time. Disadvantage: Rent is often not enough to cover a mortgage payment, property taxes and maintenance costs. Deed in Lieu is commonly referred to as a “friendly foreclosure.” Rather than forcing the foreclosure process a homeowner returns the property to the lender. The homeowner must leave the property vacant. A deed in lieu does require lender approval. Advantage: Many lenders will relinquish the right to a deficiency judgment. Disadvantage: Property must be vacant and may be reported to the credit bureaus as a foreclosure. Bankruptcy as a solution to foreclosure is an option in some states and in certain situations. If a homeowner has non mortgage debt which causes the inability to make the mortgage payment and a personal bankruptcy will eliminate the debt, then bankruptcy may be a solution. 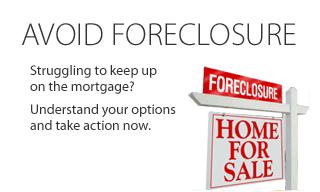 A bankruptcy will not stop the foreclosure process it will only stall the foreclosure process. Advantage: Lender approval is not required. Disadvantage: Bankruptcy is damaging to credit scores and it can be costly. If there is sufficient equity in the property and the homeowners’ credit is in good standing, a homeowner may be able to refinance their mortgage creating more manageable payments and more favorable loan terms. Advantage: May lower monthly payments. Disadvantage: It can be a costly process. It may, in some cases, raise the monthly payment. Members of the military who are experiencing financial distress due to deployment may qualify for relief. One must prove the debt was created prior to deployment. Many attorneys will work with service-members in qualifying for this relief. Advantage: May lower payments on all consumer debt as well as mortgage payments. Disadvantage: Only active military qualify. Homeowners may choose to sell their home and keep the equity. Its important to hire an experienced and qualified Short Sale agent who will ensure the home is sold quickly thus maximizing the amount of money a homeowner will retain. Advantage: Ability to save the equity in the home and avoid foreclosure. Disadvantage: Many homeowners do not have equity and will need to negotiate a short sale. If a homeowner owes more on their property than the home currently worth, and the homeowner meets the lenders qualification criteria, then the lender may allow the homeowner to sell the home for less than the amount owed in a short sale. Advantage: Typically better on credit rating and allows homeowner to avoid foreclosure. Homeowner may qualify for another mortgage in as little as 2 years. Public records will not reflect a foreclosure and may not create a deficiency judgment. Disadvantage: Short sales require patience. The process requires the homeowners’ full cooperation and the need to contract with a trained and certified agent. Call today and schedule a free confidential consultation. Every situation is unique to every homeowner. Understand you options so that you may determine a solution best for you! I would love to help you understand you options in any San Jose Short Sale situation.